Why choose one kind of Rowntree's® sweet when you can have three? 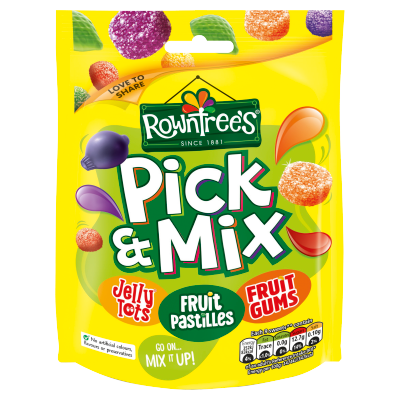 This Pick & Mix bag brings together Jelly Tots®, Fruit Pastilles, and Fruit Gums all in one bag! From the little fruity-flavoured Jelly Tot, to the chewy delight of Fruit Pastilles and the long-lasting yumminess of Fruit Gums, there's something for everyone. A selection of fruity flavours and textures makes this bag delightfully fun for the whole family. Even better, we don't use artificial colours, flavours or preservatives in Rowntree's® sweets. It's even more reason to enjoy the different flavours, textures, shapes, and colours in every delicious bag. Did you know that our famous chewy sweets have been favourites for years? In 1862, Henry Rowntree bought a cocoa works in York and transformed it into a confectionary company. Since then we've been developing brilliant fruity-flavoured sweets, from Jelly Tots® to Randoms®.